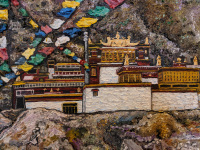 The Wind whispers “Love” is a collaborative work based on a photograph taken by Tsarong Jampa Thinlay at His Holiness Karmapa’s Tsurphu Monastery in the Tolung valley of Tibet. After sixteen years, Jampa Thinlay was finally able to return to his homeland, Tibet. Karmapa’s Monastery is one of the most holy sites for pilgrimage in Tibet and continues to be an active monastery. His Holiness Karmapa is the head of the Karma Kagyu; one of the four major schools of Tibetan Buddhism. The 1st Karmapa Lama (1110–1193) is said to have attained enlightenment at fifty while practicing dream yoga. He was henceforth regarded as the Karmapa, a manifestation of Avalokiteśvara. “The Wind whispers “Love”” showcase prayer flags with sacred text which bring benefit to all sentient beings to promote peace, compassion, strength, and wisdom. The flags do not carry prayers to gods; the prayers and mantras are blown by the wind to spread the good will and compassion into all pervading space which is why we felt this image most appropriate for the Interfaith Art Exhibit. Tsarong Jampa Thinlay: I'm a Tibetan-American web architect and photographer. My full name is Jampa Thinlay Tsarong; the Tsarong family are direct descendants from the earliest and most celebrated Tibetan physician, Yuthok Yonten Gonpo. Born in Lhasa, Tibet, I have also lived in Nepal and Beijing. I aspire to portray my homeland with visual and spiritual depth. Today our knowledge has expanded greatly through science and technology. But knowledge regarding our own mind is still limited. This is because consciousness is formless. It can only be known through meditation and other methods. From the moment of birth, every human being wants happiness and doesn't want suffering. Neither social conditioning, education nor ideology affects this. It is important to discover what will bring about the greatest degree of happiness. 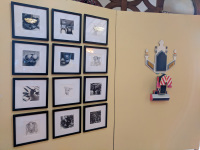 S. Newman: I have been represented by the San Francisco M.O.M.A Artist Gallery since 1996. Private collectors throughout Norway, France, Germany, England and Tibet have purchased selected paintings. My objective is to embrace the viewer by selecting subjects that portray the common denominators between people; to use art as a means of unification. To reach people is to feel their souls. That is my goal as a painter. We are from different cultural backgrounds (Jewish and Hindu) but we have a lot in common. Neither of us identifies with any particular set of religious practices, but we both consider ourselves to be spiritual people. We are both realistic artists and see creation of realistic art as a spiritual practice of expressing gratitude for the beauty that surrounds us in our everyday life. Light is considered by all cultures to give inspiration,knowledge and truth, independent of our individual beliefs and stories. It reminds us that what we all have in common is much more fundamental than whatever might divide us, and is therefore a perfect symbol of cultural unification. pastel, watercolor, and graphite. Her work has been published in multiple newspapers, magazines, and business newsletters. She works as an art contractor for Alameda County Library and is professionally affiliated to Fremont Art Association. Sara Frucht has been painting for the past ten years and has been drawing for her whole life. 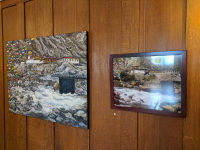 She has shown her paintings in two Interfaith Art exhibitions, and at various galleries, restaurants and other venues. She also does algorithmic computer animation and has had her animation played at various concerts and raves, as well as at Epcot Center. She also has created immersive art pieces using her patented mirror structures. 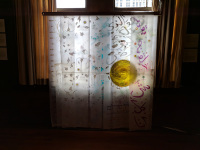 DIALOG is a visual representation of a series of conversations we had this fall, in getting to know each other and the underlying values that inform our work as artists and as citizens. Through our conversations we came to learn that we shared a reverence for our beautiful planet, a penchant for environmental stewardship, and an understanding that there is a fragile web that connects all life as one. We have come to these shared values and beliefs through different paths—Muslim and Jewish, religious and secular, prayer and research, intuitive and conceptual. 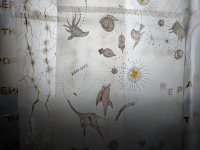 Sharon’s draws inspiration from her research into the phytoplankton living in our oceans that provide two thirds of the oxygen we breathe, or the relationship between mycorrhizal fungi and the plants they connect. The idea that a dying tree divests itself of its resources to the benefit of the community, or a that a young seedling in a heavily shaded forest might be supported with extra resources by its stronger neighbors, are amazing scientific facts, but also poetic. Even more amazing is that Salma’s devotion, commitment to daily prayer, focus on oneness, and intuitive artwork in her studio, has brought her to the very same knowledge and recognition of its inherent poetry. She has been invited to Germany twice, first on artist residency in 2000 at Schwabisch Gmund and in spring of 2011, Westphalia Wilhelm University in Münster, Germany invited to publish her paper “Art Informed by Spirituality” in the publication on the International Symposium: ‘God Loves Beauty: Post Modern Views on Religion and Art. She has presented the talk about her works at Stanford University, commonwealth of San Francisco, Seattle University and Museum of Contemporary Religious Art, St. Louis Missouri where she also had a successful solo show in 2015. She has been invited to Morocco for one-month artist residency in March of 2018 through Green Olives art Gallery. Sharon Siskin, Visual artist, community artist, arts educator. Sharon Siskin is the recipient of awards and grants that include a Visual Arts Fellowship from the California Arts Council in 2003, the 2001 Potrero Nuevo Prize, Noetic Arts Program Community Grant, San Francisco Arts Commission Market Street Art in Transit Commission in 2001, and 12 California Arts Council Artist in Residence Grants for community-based public art projects in the Bay Area AIDS services community and in the City of Berkeley homeless women and children services community. She’s had Artist Residencies at Recology in 2004 and at Playa, in 2015. 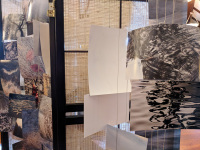 Her artwork has been featured in publications that include Notes on the Need for Beauty: An Intimate Look at an Essential Quality (2007), by J.Ruth Gendler; Women Artists in the American West (2003), edited by Susan Ressler, Lure of the Local: Sense of Place in a Multicentered Society (1997), by Lucy Lippard, Connecting Conversations: Interviews with 28 Bay Area Women Artists (1988), edited by Moira Roth and Site to Sight, Mapping Bay Area Visual Culture (1995), edited by Lydia Mathiews. 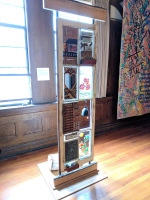 Her work as a community-based art professor is featured in Outside the Frame: Teaching Art for Social Change, by Beverly Naidus, published by New Village Press in 2009. Seeing spirituality at the heart of religions, cultures and communities, the artists explored the intrinsic need to immerse in this sensation. The artists believe that environments not providing room for individuals to seek their spiritual consciousness disunite people. When intolerance of the Other obscures the basic values underpinning religions, cultures and communities, the core that unites, rather than differentiates, becomes peripheral. This tension opens for miscommunication, fear and even violence between communities, cultures and different fractions of society, sometimes in the name of religion. Through a visual dialogue spanning several weeks, the artists sought to uncover their shared values while drawing spirituality from nature. Despite different cultural origin, Sweden and Japan, they now share the diverse broader community embodied within the Bay Area. The dialogue juxtaposes the elements water and earth, synergizing them as part of the conversation. In this dialogue, the artists acknowledge the idea that the element water provides the ability to adapt, flow and acting selflessly, whereas the element earth symbiotically provides grounding and calming effect, restraining the ego. 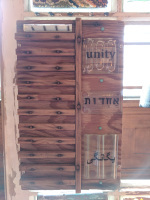 The artists propose that by purposefully recognizing the shared spiritual core among artists, faiths, cultures and communities, this can unite people in their path towards tolerance and acceptance. Takako Matoba was born in Tokyo, Japan. She lives and works in Oakland, California. Her works have been exhibited internationally including San Francisco, Los Angeles, New York City, Portugal, and Korea. She completed her MFA in San Francisco Art Institute. Li Westerlund focuses her art work on photography, mixed media and glass, obsessed with the dialectic between light and darkness, the literal and the abstract, nature and man-made, and movement and stillness. In her abstract expressions she often focuses on introspective investigations to capture that which has no structure. Education: MFA Photography, San Francisco Art Institute, 2016; LL.D. (Ph.D.) Patent Law, Stockholm University, 2001; JD (equivalent) and LL.M., Uppsala University, 1993; B.Sc. Electrical Engineering. How do Cultural traditions, ideas of personal freedom and religious beliefs intersect in the 21st century. 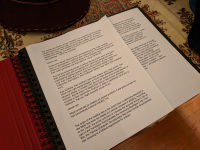 We hope our installation will promote a conversation among women, men and women and families that honors, respects and empathizes with choices made by individual women, that words like “repression” and “objectification” can be eliminated from that conversation as we experience positive the energy and rewards in our acceptance of the ‘other’ as full companions on life’s journey. Today we encounter women who cover their hair as teachers, doctors, engineers and poets, selling handbags, coffee and running restaurants and marathons. Sometimes different members of the same family whose identities and religious observances are strong, follow different paths. Here we present a dressing table, chair and mirror as a familiar setting where a woman might sit and cover her hair, tucking a lock or wisp of hair beneath the covering. 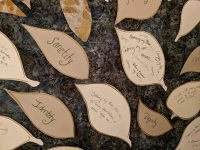 The leaves share messages of memory, tradition and belief. They are arranged as if growing from one tree, representing how we are more alike than not. My background is in textiles. All of my adult life I have worked with fibers in spinning the raw product to yarn, weaving, dyeing and knitting. I mostly produce household items and apparel. For the past 2 years, I’ve been working with Inter-Faith Dialogue. I organized a discussion group with a local Muslim group and folks from my synagogue. We have now expanded that to 2 synagogues. In addition, I am working on organizing a local woman’s group with the Sisterhood of Salaam/Shalom. Growing up in the City of Detroit, my mother and I frequently visited the Detroit Institute of Art. In a way, I grew up in the Fountain Court there, absorbing an unusual view and understanding of the world through the murals of the legendary Mexican artist Diego Rivera which dominate the large sun-lit Hall. His messages were humanistic and universal in their message of equality and shared bounty of the world for all peoples. After University, where I majored in Printmaking and History, I worked at the Bureau of Child Welfare for the City of New York. This connected me to another world of life experiences. 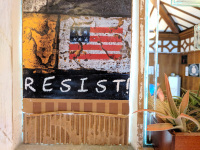 After further studies in painting, I returned to Detroit and, with several friends and the support of my young family, opened the Detroit Gallery of Contemporary Crafts and Garden Cafe in the historic Fisher Building about a mile from the Museum. During those years living in Detroit, I was greatly distressed by the increasing poverty and racial and cultural polarization in the City. 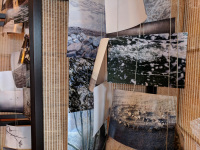 Weaver Ilana Bar-David and photographer Tom Debley were drawn together to create a collaborative piece celebrating ancient Native American culture, its relationship to the environment and the connection of the artists. 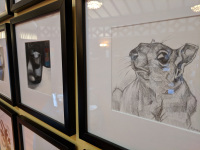 The artists met at gathering that brought artists together around the theme “Collaboration and Connection,” discovering they each had walked a similar path. 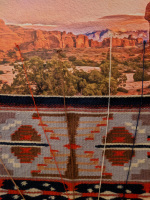 The result is a blend a painterly photograph and a weaving in an interpretation of a Navajo weaver's dye chart – which connects plant specimens with the color of yarn dyes they create. 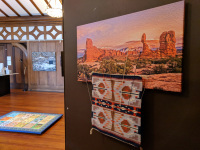 Ilana and Tom connected the colors of dyed yarns in Ilana's Navajo-style “Winter in Taos” with Tom’s photograph of an ancient Navajo living site to evoke the deeper aspects of native lands and ancient spirits. The “Winter in Taos” weaving uses vegetable and aniline dyes whose colors resonate with the larger landscape in which the plants thrive. The photograph depicts the landscape of native culture dating from 10,000 years ago with the “Fremont people,” the first sites of which were discovered later by the Navajo. Both artists have partial Native American ancestry and hope their art will enable the viewer to reflect upon the relationship of ancient peoples and their land, and its preservation. Tom Debley: I have been active in the photography community in Northern California for 15 years, although my interest and work in photography dates back many decades. My photographs have been honored in numerous competitions, including those of the Alameda Photographic Society, the California Newspaper Publishers Association, the Little Pend Oreille Wildlife Refuge, the Marin County Fair, the Northern California Council of Camera Clubs, and Photographer’s Forum Magazine. My work has been published by newspapers, magazines and on websites. 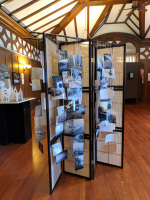 It has been shown at the Commonwealth Club of California, Hayward Shoreline Interpretive Center and the University of Maine’s Museum of Art, among other venues. Ilana Bar-David: I live in San Francisco express my artistry primarily through weaving and performing on and teaching harpsichord for 50 years. The art of weaving has captivated me for many years. Navajo style speaks to me, a natural evolution from living in the Southwest in the 1970s. It naturally bridges my interest in music. Form, rhythm, patterns and color connect my two muses. Weaving has its own rhythm. The patterns emerge, some improvised as the weaving reveals itself. The tapestry loom connects me to the land and a people I greatly admire. I love working primarily with vegetable-dyed churro sheep yarn to create both bold patterns and color shadings that build momentum. Our piece encourages intergenerational active involvement in sowing seeds for positive change. 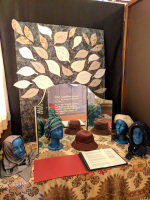 As a Jewbu, a recovering Catholic who studies Kashmir Shaivism with Gurumayi, and a former Muslim who now embraces Zoroastrianism, we each bring our own spiritual sensibilities to this interfaith exhibit. 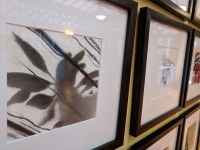 Zoe has been doing photography since the days of 35mm film and has been working with fused glass for about ten years. 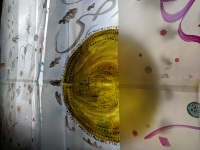 She is interested in combining fused glass with photography, recycled materials and found objects. She has deep gratitude for the teachers who have encouraged her creativity and for her mother who also loved to feel her creative juices flow. Born in Tehran, Iran, Mojgan immigrated to the United States in 1983. She has a passion for painting, photography and glass fusing, and has been exploring with different mediums throughout the years. Her inspiration for her art comes from lucid poetry, nature’s purity, and simplicity with complex relations to human interactions. Jeanne has loved to draw life and play piano since she was a kid. In her 50’s, she began working with the human figure and animals in 3D--first in clay, then cement, styrofoam, cardboard, bronze and iPhone-ography. She only lightly identifies as an artist for its permission to look, play, invent and not always secretly watch the interplay of light, form, color and life. Daniel has been creating with wood for nearly a half century, crafting frame drums and cajons, toyboxes and catwalks (for cats), cabinets and balustrades. He also spent several years designing and constructing a three-story, seven-color, off-the-grid neo-Victorian home in the Sierra foothills. His other interests include bicycle touring and Persian drumming.